Why choose to buy a property in Istanbul? In short: Locations, locations, and more locations. Choosing a property to buy in Istanbul can be seen as a daunting task. The city is sprawling and each corner speaks to its own uniqueness. It takes a long time to even comprehend the city in its fullness, usually years. But most people come with a set of preferences and these can be used to quickly rule out or rule in some locations where people may consider buying property. Budget can also be a determining factor. If the budget is under 500,000 TL probably the best option would be one of the suburbs. There is also probably not much point looking on the Bosphorous unless the budget is in excess of 5 mil TL, given the fact that there is limited supply of these properties on the market and always in high demand from locals and foreigners, alike. Some buyers just want downtown. Well, they are in luck. You could even argue that there are at least a half dozen downtowns, all having their particular claim to the title. Downtown on the Asian Side? Well, that would probably have to be Kadikoy or Bagdad Cad. But for those who live on the European Side, there is an equal argument for areas such as Beyoglu, Sisli, and the CBD area of Levent. Others would argue that the sea side gem of Bebek is the only true downtown (if you drive a Ferrari). It is hard to argue one over another, as it merely is a matter of taste or perhaps where people work, or even where their family has lived for generations, as can often be seen in the likes of such neighbourhoods as Kadikoy. All represent dynamic and vibrant downtown neighbourhoods with ample restaurants, bars and entertainment venues of all sorts. They are also all more or less transportation hubs, so when seeking to buy a downtown property, beginning a search in one of these areas would be an appropriate start. Others would argue that the old quarter in Beyoglu is the true downtown, dating back hundreds of years to the mercantile operations around the famed Galata Tower. It calls itself home to the largest concentration of expats, and is also the undisputed cultural and entertainment centre of Istanbul, though Kadikoy has made impressive inroads in the past 5 years. It is also hands down the tourism centre of the city. If people only know one street name in the whole of the city it is sure to be Istiklal. It goes through its ups and downs, but surely still has a strong claim to be the true downtown, both past and present. Prices can range anywhere from 7000TL/ sqm. Expect to pay much more for a property with a view. Finding tenants is pretty easy if the property is kept in good order and the fee is appropriate. For more information Contact Us. A lot of foreigners end up in Sultanahmet during their stays in the city. Although it has a lot of character and history, this is truly a tourist destination and offers little value in the way of property to buy. Not to mention the fact, much of the quaintness would wear off after a while and you would be stuck with tourist prices for restaurants and line ups, etc. Finally, there is very little residential in the area. Bosporus properties are really an entity unto their own. The market is quite opaque and not many estate agents have a good price history for the area, as so few properties change hands. Owners of property in this area will often not put their property on the market unless they are in financial trouble, thinking that it is irreplaceable. In many respects, this is true, but it does lead to uneven asking prices and expectations. This market is probably best left for Qatari sheikhs and local business moguls. Prices (with a view) start from 30.000 TL/ sqm and go much higher for a villa with some historical charm and a good position along the water front. It is in many senses, by far, the most impenetrable real estate market in the whole of Turkey. Once the preserve of the Ottoman elite and affluent foreigners working in what was Constantinople, the mansions, known as yalis, were made famous in novels and more recently through modern Turkey’s hugely successful TV soap operas. If you are looking for what constitutes pure suburbia in Istanbul when buying property, there are luckily many options, and also affordable ones. These areas are home to a lot of the construction of huge high rise building complexes, new universities, hospitals and shopping malls. There is usually quite a time-consuming commute to the city center, but with the increase in the Metro system infrastructure, as well as the addition of the 3rd bridge, the super-cool underwater tunnel, and the pragmatic Metrobus, many before inconceivable locations have opened up for living as well as for investment. Beylikduzu is one of these shining stars, with many choices in new buildings with all the facilities (swimming pools, concierge, playgrounds, fitness studios, etc). Though not technically luxurious, they are quite utilitarian and time-saving. Prices in such complexes can start as low as 5000TL/ sqm, but are starting to go up. Developers are also offering more attractive payment plans than in years past. If Beylikduzu is not your cup of tea, you could do a targeted investment near the 3rd bridge or the colossal 3rd airport. Both areas are booming with new construction. Proximity to airports can often be interesting in that the profile of tenants is quite good: they often spend less time at the property (hence, less wear and tear), they usually command greater than average local salaries, and are usually well-educated. If none of these options suits you, then you could always try something along the Black Sea, or the Islands in the Marmara Sea. Saying that there are many options for purchasing a property in Istanbul is really no exaggeration. Andrew Henderson is the founder of Nomad Capitalist, the world’s most-visited resource on issues of legal tax reduction, investment immigration, and global citizenship. He works exclusively with six- and seven-figure entrepreneurs to help them and their money “go where you’re treated best. In general, could you explain the essence of the real estate to citizenship program in Turkey, both currently and in the past? “In early 2017, Turkey introduced its own citizenship by investment program. Like any such program, you make an invest and almost immediately get citizenship in a commoditized way; everyone except Armenian citizens qualifies. What countries do you think will benefit most or make use of the program most, and why? What benefits do you feel it would offer for European/Western buyers of property in Istanbul? I can think of one example: Many Europeans live year-round in Turkey, especially in the coastal areas. Some have residence permits, but they are temporary. Others, have to navigate the tourist visa route, which poses challenges. “I have a residence permit in Montenegro on the basis of owning property. It will never entitle me to citizenship, and I can renew it every year. I don’t see that as a huge burden, providing they don’t enter the European Union and increase the standards to qualify for renewal. The same feelings are likely held by the Brits, Germans, and others living in Turkey; I don’t hear from many Europeans about the need for a second passport in a “Tier C” country. How does Turkey benefit from this program? Clearing out that glut in the construction market could help developers sell their inventory and keep hiring for new projects. It’s worked in countries like Portugal, where a “Golden Visa” residence permit helped turn the real estate market around from the doldrums of 2009. We will see how valuable a Turkish passport is perceived as. Could you compare it to a few other countries programs, some good, some not so good? How did you start your business, NomadCapitalist? I watched several of your YouTube videos and was very impressed, and also noticed you have a good viewership. You do not just offer valuable insights on citizenship programs. There is also a lot of other great information for expats and investors alike. What are some of the more popular subjects you have covered? Do you think it is a good time to buy property in Turkey? And why? Do you think buying property in Turkey can be a good hedge in a carry trade? What do you envisage for the future of Turkey’s program? More changes or a loosening? “While there has been a Caribbean citizenship price war in the last year, I think most countries – especially a larger one like Turkey – isn’t going to constantly tweak. Honestly, you can debate about WHETHER you want a Turkish passport, but I think that if you decide that you do, this offer is rather attractive. Something very strange is happening in Turkey these days, though I have probably been the last to point it out (Well, in fairness, I have also been saying it for a while!). Everywhere you turn in Istanbul, viewers are transfixed to TV screens that are at bulging and blaring with economists, pundits of one variety or another, politicians new and old, as well as stock market graphs and USD vs TL quotes that seem to fluctuate faster than the moving eye. Wild stuff. And a far cry from the heady days of circa 2005, when barely a storm cloud on the grand Turkish Empire was visible, from Istanbul to Aleppo, and from Ankara to Tehran. New finance ministers and the old, new Eu ministers and others left out to pasture, vie for air time to get their shot to expound, often ex cathedra, on the profound sense of crisis that charges through the concern-laden summer air that canopies the Bosphorus, a channel very much inured to talk of crisis; diplomatic, political, economic or whatever you care to mention. But this one has gripped the imagination of one and all; the Turkish population itself, the government, the opposition, the so-called ‘West’ and the EU – all left just a little more than dumbfounded. How could this country – just a few short years ago – the darling of the Middle East and a favourite of those inside Washington and Brussel’s power corridors, and a country achieving blisteringly high growth rates into the bargain, arrive at such a state where the TCMB (Central Bank) had to make an emergency 6.25 % increase in the interest rates? Strange beyond strange. There have been many scapegoats put forward and many attempts to make sense of the situation. To some, it is all about a US pastor held on terrorism charges, that Turkey refuses to release, to others, Turkey’s leaning towards Iran and Russia, and its planned purchase of military hardware from Russia, supposedly non-Nato compliant. Or finally, a result of the many gaping and open wounds festering in the Syrian catastrophe. The Turkish diplomatic assault has variously attributed the shaky economy to economic warfare – posed by – we are not sure, exactly – Interest rate lobby groups, foreign powers and so forth. Luckily, many of these are mostly political in nature and could expect to be resolved through diplomacy. Perhaps, also, the eroding effects of time will wash away some of these issues and a new normal will emerge. Ample fodder for upcoming PhD students to labour over, for sure. Ah, but let there be light!!! Istanbul property has often been viewed as a safe haven, at least by those in the region, many of whom are used to some very un-safe alternatives. Bankable stuff. Bricks and mortar and all that, a kind of Turkish gold. Above the din of panicked markets and currencies, and no-name analysts from this or that Capital Group, the shiny towers of Istanbul’s skyline boast an impressive array of both new and old architecture, with minarets hearkening back to a glorious Ottoman past while the silhouette of some of the finer examples of modern buildings nod to a Dubai-like future, if not even greater. Well, at least that is the narrative preferred. But on this balmy late summer day on the Bosphorous, I am getting more calls daily from developers’ sales forces trying to enlist me to sell their property than ever before. Actually, multiply the average by 10. I have actually gotten into the habit of telling them our office has closed when I realise it is another sales pit-bull on the other end of the line. I have not heard any of the same bravado for several years at least. Most are inexperienced junior sales staff put in a tough spot, cold calling on agencies they know do not have many real buyers. But the lure of hitting jackpot is there : you are a foreign real estate agency and may hold the magical – though somewhat fictitious key – to vast sovereign wealth funds of Arabian extract, private equity dying for a final resting place, and perhaps even more improbable wonders. Of course, some are just hard-working sales staff going through their rolodexes and doing good detective work. Levity aside, Istanbul is still a great real estate market and one of the world’s truly great and dynamic cities. Therefore, a well-researched property acquisition rarely will go astray. The key is to look a little deeper than the initial glossy brochures you will inevitably be met with and to unlock the hidden value through your research and persistence. So, in the face of all this turmoil and uncertainty, indeed even crisis, what can be done? Well, successful businesses look inward and try to plug up holes and cost-cut in times of difficulty. The Turkish real estate market is no different. Some bad habits formed during peak years and now is a great opportunity to address those ‘inefficiencies’ or ‘drags’ on the market. This list, by no means exhaustive, points out many areas in the Istanbul real estate market where improvement could be made by various parties from; the developers to estate agents to the foreign buyers, and even to the government level by introducing policies that promote and facilitate the sale of property to foreigners. There are of course many things that could be done for domestic purposes as well, yet for our purposes here, narrowing the focus to the segment that relates to foreign purchases, is sufficient. Developers’ boasting of high rental income on projects. You must research the rental incomes of comparable properties in the area and also consult with an independent real estate professional who would be able to tell you in seconds how much a prospective property will generate in income. You may also use that agent later on in the process of searching for new tenants, so starting off a relationship early is not a bad idea. The access to mortgages for foreign buyers is limited and many find the high rates in Turkey unattractive. This is a tricky one in the sense that if you borrow in TL and the TL slides, your debt can actually be much lower in currency (a kind of reverse carry trade). Still, it seems the best way to purchase property in Turkey for foreigners is to pay cash (possibly even reverse mortgaging an already-owned property). Why property owners in London are not arriving on the shores of Istanbul to snap up property is beyond me. Of course, many do, but I would expect some areas of Istanbul to be Notting Hill. Paying cash also increases your bargaining power, no doubt about it.If viable mortgage products are made available to foreign buyers and some loosening of paper work requirements are made – especially for buyers putting in 50% cash on purchases – there could be a veritable explosion of new waves of interest from just about every corner of the globe. Turkish property affordability and ease of purchase would become legendary, as the door would be well and truly open. Why banks will not give 50% LTV has always been an impenetrable mystery. Unrealistic expectations. Can anyone really believe that they can generate 10% annual income on a luxury property? Yields in Monaco are about 1%, London 2.5% at best, Paris about the same, and Pyongyang, well, er, a published 18% (according to Dennis Rodman, perhaps!). Yields in Istanbul run from about 4% for luxury properties to 7-8% for standard investment properties. If you get 10%, pat yourself on the back for a job very well done. Lack of research/understanding of market by buyers. Many foreign buyers come spectacularly unprepared for purchasing property in Turkey. Telling an agent the size of the property desired as well as a specific location are a minimum. Just saying I want something in ‘central Istanbul’ is not really helpful. Think of Istanbul as a country in itself. You would not walk into a realtor in Toronto saying you are looking for a property in Central Canada, though it might be a useful ice-breaker and create some mirth. Lack of communication on all sides; agents, buyers, sellers. This seems like a non-starter, but it is vital. Many times deals break down from things as simple as one side not receiving key information in their native tongue. If you do not speak Turkish, at minimum, you should have a Turkish speaker who is also fluent in your native tongue, whatever that may be. Buying a property is a big deal and there are many small, but essential details that can get lost in translation, so to speak. If you are using a lawyer, use one whose language skills are impeccable. The lawyer acts as an impartial player in these transactions and it is his/her job to relay information impartially and also to defend your interests exclusively. They will be able to advise you on all technical aspects of a transaction, but may not offer insight on the value of a property, etc, as that is really not their expertise. If the agent or developer point of contact only speaks Turkish, you may be in for a rough road. In a city with millions of highly educated, young and entrepreneurial people, finding proper assistance is not very hard and you should insist on it. There is now an attractive real estate to citizenship program on offer by the Turkish government. It is quite enlightened and could benefit many in the region looking for a bolthole from unrest in their home countries. For more information click here. NOTE: This will also be the subject of next blog, with some key analysis by a foremost figure in the field for such programs. and founder of NomadCapitalist. Your currency goes a far way in today’s market, but this trend may not last forever. This graph represents the TL vs. USD over the past 5 years. It looks like now is truly the right time to buy, as many analysts are now saying the Turkish Lira is actually undervalued, largely due to what is hoped are temporary political reasons (discord with U.S.). The much-vaunted Big Mac index, for what it is worth, also confirms this. Government. There is stability at least for the next few years. One has to believe that this will eventually have a soothing effect on markets. Finally, Turkish property will do away with USD and Euro pricing, as decreed by the president. This should have a net positive effect for foreign buyers looking to seriously buy property in Istanbul as reported by the BBC here. This is shaping up to be quite an unpredictable year for Istanbul property. Those familiar with the Istanbul real estate scene will know that this is not exactly a new phenomenon. One of the biggest surprises so far has been the dramatic crash of the Airbnb and short-term tourist rental market. In the past several years many people made extraordinary returns renting out their property in Istanbul to tourists on a short-term basis. This year, however, it is quite a different picture all together. It is actually just a classic example of supply and demand mismatch. There are a few other factors that are adding to it and exacerbating this seriousness of the decline. Unfortunately in the past years they’re just have been so many hotels built as well as so many Istanbul property owners who have looked to short-term rentals as a nice way to increase their overall yield on a property as well as to enable them to use it from time to time. is this a new dawn for Istanbul property? Several years ago I predicted that this was inevitable and I was surprised,in fact , that the good times went on for so long. I knew young people, often students, who were renting out flats for the purpose of sub letting them out to tourists. In fact, it became quite a trend. As the number of tourist rentals exponentially, the demand at the same time actually began to show signs of tapering off. Istanbul is a huge tourist draw and the number of tourists coming here yearly is breathtaking. The issue is that the competition between hotels service Apartments grew while the number of tourists who opted for short term apartments actually decreased. Many tourists come from the Middle East and other regions of the world where the idea of renting somebody’s personal property is not widespread and, in fact, may even be considered peculiar. The European tourists are the ones who actually prefer the conveniences and flexibility offered by serviced Apartments. But their numbers have been declining for the past few years for a number of reasons. I think that this is unlikely to change fundamentally over this short period. It looks like it will be a classic boom-and-bust cycle with the weaker operations getting weeded out and perhaps the stronger ones getting more market share as the others are forced out of the market. This could take a few years to play out. It’s not an overnight thing. The areas I am referring to are in downtown Istanbul so they are likely to rebound when the supply and demand issue works itself through the system. What interests me more however is how it interacts with Istanbul property prices in the downtown area. The first thing that I noticed almost immediately in the past few months was that so many more properties in Istanbul came back onto the long-term rental market. It was literally a flood. And these are Apartments that have been well decorated, furnished and designed in order to appeal too wide range of tourists. The demand for rental properties in downtown Istanbul is pretty steady and strong. At the moment though this glut means that many properties that would usually be quickly snapped up remain empty for much longer then they would have been in the past. Many Istanbul property owners are frustrated by this turn of events. Some have to pay mortgages and the lack of income generated no doubt creates stress. For this reason as well as many others it is not a big stretch of the imagination to conclude that quite a high number of those people will decide that it is time to cash in and sell their property in istanbul possibly in search of higher-yielding properties. Is this all bad news? Not necessarily. The people who ran good short term rental businesses well may actually benefit from this in the future but they will have to be patient of course. The other very positive aspect is that house prices really have become artificially high in the downtown area. Many of the owners do not understand that the prices far exceeded affordability levels. Prices of $4,000 or $5,000 per square meter for properties with no particular outstanding features are just too high given the fact that interest rates are also very high. This has created an environment where very few transactions are actually occurring. People involved in the market understood this well and were waiting for some event to break the log-jam. The dramatic free-fall being witnessed in the Airbnb scene looks to be exactly that catalyst. Homeowners in downtown should not fret too much. Many of them have made exceptional returns and should be pleased with the investments they have made. Many also have lovely properties and will not sell under any circumstances. And this in no way will cause a crash in prices. It will just mean that some people will make the rational decision to cash in on investments and perhaps try something new. This will create buying opportunities. 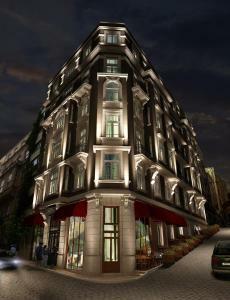 Over the mid to long-term, Istanbul is an exceptional place to own property. Owners will just have to get used to the new reality and reduce their rental prices or their asking prices when looking to sell. There are still enough buyers out there that they can certainly sell their properties to. Conversely, for new buyers it does represent an opportunity indeed. Also for many young people who have effectively been locked out of the market, this may be their moment to get on the ladder and own a home. In short the last few years represented a slow down in investments in the downtown area. What is happening these days may actually spur new investment, as investors see price levels that will be very tempting. Being such a rapid and dramatic occurrence, I am very interested to speak with anyone connected to real estate in downtown, in order to brainstorm with a view to coming up with solutions to combat the adverse effects of this sudden new reality. I have been coming to Istanbul regularly since 2008 and even in that short period the changes are amazing. I recall being really pleased when the Belediye replaced the paving on our street, but that is nothing compared to some of the major changes that have happened. In less than ten years a metro has been built that can take me from Taksim to the airport and over to the Asian side, with a trip over the Halic on the way. The infrastructure programmes have been amazing, and when compared with how slowly Crossrail has been built in London it makes me realise just how much has changed in a short period of time. The new crossing to the Asian side came in particularly useful to me when I accidentally booked a ferry ticket to Bursa from Kadikoy instead of Kabatas. The twenty minute journey to Kadikoy wasn’t anywhere near long enough however, for me to come up with a reason why this was my other half’s fault and not mine. Regeneration comes in many forms, some good and some bad. Where I live in London has had extensive regeneration and I recognise a similar process in Istanbul. It makes buying a property here a slightly daunting prospect, as rapid change can make it difficult to know what will happen in an area, and one must just hope that the changes will be positive. Istanbul is a wonderfully comfortable city to visit, a good friend I love to see again and again. But like a friend who buys too many clothes, you can never be sure what you will see next and if you will like the most recent trend. One of the biggest changes I have observed is the growth of what could be described as alternative lifestyles, more often than not described derisorily as ‘hipsterism’. Often seen cycling along the streets of Hackney in London, I see similar styles more and more in Istanbul. Turks make particularly fine hipsters as dark hair and high cheekbones really help to carry off the look and Turks are one of the few people who can get away with an ostentatious Ottoman style moustache. At first hipsterism was confined to Cihangar, but soon the abundance of top nots and beards became too much for that small area and it began to spread it’s tentacles across Beyoglu. For a long time however, it seemed unable to get past the natural barrier that is Taralabasi boulevard. Not surprising, as that traffic can be a bit of a nightmare to cross at the best of times, never mind on a fixie. Eventually though the hipster tide broke down even that wall and I started to see hipster cafes everywhere. Well, I think they were cafes, but they might just have been really trendy people sat outside their house having a coffee. Of course, there is nothing wrong with being a hipster, local organic vegetables and artisanal cheese is great and my male friends love being free of the tyranny of shaving. Istanbul is big enough to contain a wide cross section of people, including hipsters and hijab I teyzes in baggy trousers, this is part of what makes it an amazing city and why many of us want to own a property here. And then one day, walking down Omer Hayyam, I smelt change in the air. Was it the Belediye fixing the street? Some hope there, Omer Hayyam is still a slippy slope in the slightest bit of wet weather. Maybe it’s those slightly uneven steps and nasty bins under the bridge. Perhaps it was a Starbucks, we all know there is no cap on the number of Starbucks that can exist in any one area. And then I saw it, like a beacon in the night. A Carrefour mini supermarket. On Omer Hayyam. Just around the corner from my flat. My heart beat faster, could it be true? I peered in the window and there they were, hipsters shopping. And I knew that whatever happened to the area, we would be safe, as there was somewhere locally to buy milk. So thank you hipsters, your top nots might be daft but you’re brought Carrefour a bit closer to me. Last year, we did a few small blog pieces on the very much up and coming area of Sapanca Lake just two hours from Istanbul. Since then, as we predicted, demand for properties in the area has surged. New projects, catering to the lavish demands of GCC individuals are popping up throughout the region. Large villas in private compounds with ample green spaces, community and recreation centers and full security seem to be the property type of choice. Lilimont has done extensive research and come up with what we feel is an ideal lifestyle, as well as investment choice. VHSapanca Luxury is a joint Saudi-Turkish boutique Project that is scheduled for delivery in eaerly 2017. Financing is available through a leading Turkish financial institution and spans an installment period of 24-48 months. The high quality finish, lake and lagoon views, and the centrality of the project (15 minute walk to downtown Sapanca) makes his Project a bargain at approximately 1200 USD/ sqm. It is anticipated that off plan buyers will achieve a thirty percent appreciation by the time of delivery. Prices range from as low as 350,000 USD up to 750,000 USD for properties ranging in size from approximately 300 sqm to 650 sqm of internal with generous, private terraced gardens. Inquire now with Lilimont for a brochure and specially secured early buyer discounts. For the saavy investor in Istanbul real estate, the street names of Faikpasa or Cukurcuma are probably already quite well-known and have come to signify what urban chic looks like in this city. A generous sprinkling of cafes, galleries, antique shops and boutique fashion stores line the narrow streets, inviting the wanderer in. A great neighborhood for endless strolls, Faikpasa is located within a few minutes of the bustle of Istiklal, yet maintains its European Old World feel with dashes of contemporary Turkish creativity. A number of gorgeous boutique hotels that have recently opened make it a fantastic holiday destination offering accommodation par excellence. The mix of nightlife, history and the general sensory overload make for a heady, intoxicating experience. Well-priced home made Turkish food is in abundance. All making the area a go to for Istanbul property investment. This 150 square meter property was originally two separate apartments that have been combined to allow for ultimate luxury. Located at the top of Faikpasa, featuring architecture that reminds one of Barcelona, this second floor property has carefully restored original features: wood flooring, hand made Turkish tiles, high ceilings, exposed brick, and marble elements sourced from the local shops. All synonymous with Istanbul real estate. Twin French balconies provide a perfect place for watching the goings-on in the thriving neighborhood. The asking price of 450,000 Euros is likely to be met in the coming months, with intense demand from young, well-heeled Turks, and foreigners seeking a property that exudes the essence of old Istanbul charm and sought after real estate in Istanbul. As Istanbul is a sprawling metropolis, it is essential that any would-be buyer narrow down the neighborhoods in which they would really like to live. The far-flung suburbs offer a very different experience, and are a big commute into the center. Although prices are very reasonable and there are endless new projects to choose from, one might find the living tends towards the generic and does not offer the full palette that brings visitors by the millions to the ancient waters of the Bosphorous. Before you attempt to start looking for particular real estate, spend at least a few days going to some of the more popular neighborhoods and try to get some feel fort hem. They are typically quite distinct from one another in many ways, not just in pricing. Another good piece of advice is to seek out an English-speaking estate agent. 90 % of Istanbul real estate agents will have very limited English skills and this poses a wealth of problems and will likely result in at least a fair bit of lost time. Although the market has surged in the past decade and the days of ridiculously under-valued property seem to be very much a part of the past, the discerning Istanbul property investor still should be able to find a property with lovely character and pricing in line with what you would expect from a major world city, of which category Istanbul no doubt belongs, and indeed has belonged, for many centuries. Finally, do not take the asking prices on the internet at face value. Bring your keen negotaiting skills to the party! One of the most difficult yet necessary tasks of an Istanbul estate agent is to moderate the sometimes exaggerated values owners have of their own Istanbul properties. To further compound the sensitivity in this is the constant state of flux that exists normally for real estate markets, as well as imprecision in assigning a value to a particular piece of istanbul real estate. I can tell you, over the years, I have certainly seen both ends of it. I have seen property in Istanbul sell for much more than I would have imagined, but more frequently, I have seen properties sit idly for sale for eons due to incorrect asking prices. Though far from exhaustive, the below list should give you some idea of whether or not your expectations are in line with market reality. You have assessed the property as objectively as possibly in the context of the broader market. It is important that you have not just gone on the internet and done a superficial search on asking prices. Be aware of neighborhood transactions and compare to your property. You have had two separate real estate agents in Istanbul provide valuations. You may want to consider paying a small sum to them, as this might let them know you are serious about getting an accurate, well-thought out assessment. Has your property been on the market for 6 months? This is a sufficiently long enough time to gauge market feedback and also long enough if some temporary blips (political uncertainty, etc) might skew price trends. If your property has been on the market for a year or more, ask yourself the question if you are really serious about selling your property. Have you been following your estate agent’s client flow? If they are averaging less than one viewing per week, it may suggest a problem. Of course, for higher end, more rare real estate types, this may be overly-ambitious. However, for your average property within the majority of buyers’ reach, you should be hitting this number, with one view every two weeks being the absolute low. Do some clients seem offended when you show them the property? Although this is a pretty extreme situation, it does happen. I rarely will agree to take on a property that is offensively overvalued, as it immediately destroys credibility and wastes time. Some clients will be very forthright and comment on an absurd asking price. If you hear such comments, do not just brush them aside. These people are not doing this as a negotiation tactic. They will not be making an offer on the property. Very basic, but are offers coming in? Are some clients coming for a second viewing. If you are not getting any second viewings at all, that is a huge red flag. I always sense when selling a property is imminent and one of the big cues for this is several clients making repeat visits to the property. Yield, yield, yield. Assuming your property is not a Norse Castle somewhere north of Stavanger, most clients will be interested in how much rental income a property could achieve. Just about everybody has some idea about rents in local neighborhoods; it seems to be wired into our survival DNA, so it should not be hard to figure this out. And one of my personal little favorites. If you are using general listing sites that count the number of hits you have and they have an “add to favorites” function and you are not getting more than one “add to favorites” out of one hundred, it is a signal that even in the impersonal online theater, buyers are not even tentatively showing an interest! My hot properties usually get 3-10 “add to favorites” in one hundred. Try it some time, it is a lot of fun. So, in short, in the rough and tumble world of real estate, a little self-monitoring can be a valuable tool! What is drawing the big names in football to Istanbul? Turkish football and the Süper Lig may not carry the same global prestige as the Premier League, but the profile of Turkish football has been regaining strength in recent years, due in part to a number of high profile names heading for Istanbul. But what is it that saw players as high profile as Didier Drogba and Wesley Schneider opt to play at Galatasary a few years back, and more recently lure United team mates Van Persie and Nani to Turkish rivals Fenerbahce for the coming season? Well despite the reputation of a league, the obvious light that attracts even the largest moths in the game is of course, money. Heavy investment, big sponsorship deals and improvements in grounds and training facilities have allowed teams around the world, to evolve into a more tempting proposition for the big names. We’ve seen it in China, Russia and probably to the greatest extent the USA. “Soccer” is fast becoming a national past time in the states and the MLS draws vast support despite only being a spritely 22 years old. Robbie Keane, Steven Gerrard, David Villa, Kaka and most notably David Beckham are amongst the big names to head state side. But the MLS has been branded with the unfavourable title of the Premier League’s retirement home, as players head for warmer climates to see out the twilight years of their careers. The same however cannot be said for the Turkish league. The rivalry within Istanbul alone between Galatasary and Fenerbahce, and to some extent Besiktas, is arguably one of the fiercest in the game. With Galatasary and Fenerbahce in particular offering a very real chance of excelling in European football, the pace is far from leisurely. So for those not quite ready for the retirement home, Istanbul offers the competitive football they require but what else? Well with some of the best tax rates outside of Monaco RVP will be keeping the large majority of his £240k weekly wage in his pocket. Not only this but the cost of property in Istanbul is considerably cheaper and, even the high end market offers more for your money than you’ll find elsewhere in the footballing world. The average cost to rent a one bedroom apartment in Istanbul is just £310 a month, a 52% difference to the £650 a month in Manchester. Over 80% cheaper than renting in London at £1,600 a month! With their £4m+ transfer fees, it is unlikely either Van Persie or Nani will be struggling to afford the cost of living in Istanbul, or that they’ll opt for a one bedroom flat in the city centre. Professional footballers are wrapped in cotton wool these days and their agent organises everything from their hair cut to their living arrangements. The majority of them end up rubbing shoulders with the Istanbul elite in the high end housing developments, that provide the secure environment needed to keep them away from prying eyes. Developments such as Istinye Park, Listinve, Selenium Twins and the Macka Armani Residence (rumoured to be home to Sneijder’s multi-million pound pad) are all popular options. “The privacy of these luxury residences with their high quality fitness and wellness areas, 24 hour security looking after the needs of Istanbul’s elite, swimming pools and full concierge services seem to be de rigueur in the choice-making of these wealthy, though often temporary expats. Many, of course, opt for rentals in the same type of compound. However, others sense that the exorbitant rents make it a wiser choice to purchase a property with the anticipation of price gains. Lilimont Istanbul are listing such apartments in this luxurious development in Florya, situated within eight acres of landscaped grounds. It boasts sea views, a central but private location, its own shopping centre, food, drink and entertainment facilities, a playground and health and fitness facilities including a Turkish bath. These three to seven bedroom apartments start as low as £390,000. But if this expansive development is a little too open for the camera shy footballer, an apartment in this extremely exclusive Selenium development in Sisli may be more appropriate. Each of the buildings offer every amenity our former Premier League stars might expect from the finest hotels. There is a grand entrance, fitness facilities, the buildings personal security as well as lounge and restaurant space to name just a few. The development is one of the premier property projects in Turkey at present carrying the prestige associated with a top name in football. An apartment on one of the top floors will set you back just over the £1m mark, with one on the lower floors priced around £700,000. A real steal when you compare the quality and price tag with similar projects around the city. However for the footballer that likes to think for himself there are other options offering the expensive flash lifestyle, but with a trendy city location that will provide a taste of Istanbul’s culture, not just another private gated community. It doesn’t get flasher than living on your own exclusive island and the Karamanyan Timber Mansion would make the perfect footballing residence! It lies just off mainland Istanbul on the second largest of The Prince’s Islands”. The prestigious location is a stone’s throw the island’s private beach and beach club and is steeped in history. Standing 60ft tall it is easily the most impressive property on a street whose name translates to “Street of Mansions”. Or if Robin or Nani favour a drive to work over a speed boat, this penthouse apartment in Galata ticks all the right boxes. The two bedroom apartment offers panoramic views of the Golden Horn and Bosphorous are spectacular, further brought to life by the property’s oversized living room window. The 40sqm terrace provides outstanding views, overlooking a gothic church that remains from the Crimean War. So if RVP or Nani are still in the market for a property, they should visit us at Lilimont Istanbul, and we can help them find something a bit more unique than an apartment in a closed community. On occasion, history and Istanbul real estate intersect and that is when the work truly becomes interesting. A few weeks ago, I took a speedy ferry which brought me out to Heybeliada, one of the chain of Prince’s Islands just beyond the entrance to the Bosphorous. Immediately upon disembarking, you shift into low gear after the whizz of Istanbul life. No cars, just horse and buggy transport and a tranquil early twentieth century feel. The Islands seem made for leisure and are a perfect anti-dote to the break neck pace the Istanbulu knows so well. The low density of property, the abundance of green and the car-free streets allow you to amble up the gentle hills past grand Istanbul mansions hearkening back to former glory. Many have now been carefully restored and the Island is again very much coming into vogue, with wealthy families such as Koc and Sabanci, having luxurious abodes. This valuable Istanbul land (asking price is 4.5 million USD) that we have just added to our portfolio used to house an ornate mansion in the “Egyptian Revival”style belonging to the last Pasa, Abbas Halim. It was an architectural gem of the famous architect Hovsep Aznavur of Armenian descent and also mastermind of Misir Apartmani, a landmark property in Istanbul on Istiklal Street. Abbas Pasa was known to be close friends with many of the famous poets, artists and architects of the time. The original structure was carried piece by piece back to Egypt and now there are just a few stone’s remains. The unparalleled beauty of the land, as well as its proximity to the sea, make it a great choice for a hotel or a completely unique palatial residence for the enterprising individual. As the permits have all been approved, construction could proceed quite quickly. The price is believed to be negotiable and, based on research, it represents a golden opportunity to aquire a piece of historic and superb real estate in Istanbul.